Word is spreading abroad about the quality experience students have at Indiana State University, as international student enrollment has edged higher this fall, according to university officials. The jump to nearly 1,100 international students in 2014 is an 18.5 percent increase from last fall when 926 international students were enrolled, which was the highest enrollment since the 1970s. The diversity of countries and students has Chris McGrew, director of the Center for Global Engagement, excited. "Middle Eastern student numbers tend to always be big, but now we're seeing our West African student population grow and are up in the number of students from Ghana, Congo and Nigeria," he said. "One of the students who studied here last year came back to work on a master's degree and brought his girlfriend, who is also working on her master's degree at Indiana State after hearing what a good experience her boyfriend had," McGrew said. "These experiences, if they're good for students, can cause ripple effects like that." It only took junior chemistry and pre-med major Mopelola Akinlaja from Abuja, Nigeria a semester to acclimate herself and find a home at Indiana State. "I'm gaining a lot of knowledge at ISU and building relationships," she said. "As an international student, the most valuable service for me is the (Office of International Programs and Services). I am glad that there is a place I can go on campus and be more understood than anywhere else and also takes time to plan events for us as international students, recognizing our uniqueness in the school community." More than half of the international enrollment this fall are students sponsored by governments, military, oil companies or police organizations, including 480 students from Saudi Arabia, 70 from United Arab Emirates, three from Japan, four from Qatar and six from a Saudi oil company, Aramco. Indiana State began assessing a $300 fee per semester for each sponsored student this fall because of sponsor-required conditions that involve extra faculty and staff time. Funds will benefit the education and experience of sponsored students. "The application process requires additional work with the embassies and our office has to monitor these students to make sure they aren't taking online classes without approval, so we coordinate with the departments and advisors," said El-Houcin Chaqra, associate director for international development and academic linkages. "Consequences for not following the rules can be problematic when students return home and try to seek the equivalency of the degree. If online courses haven't been approved, they may be refused the equivalency and will have wasted their time." In researching other U.S. universities, Chaqra said most assess a sponsored student fee of at least $300. A fee proposal drafted by Chaqra's office was approved by the sponsoring agencies and the university's board of trustees. "When we brought this to the sponsoring agencies...they supported it because it not only supports their students, but encourages more interaction with the campus and community," he said. 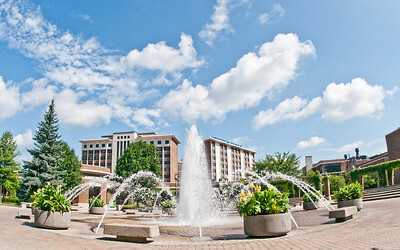 The fee will be used for a variety of purposes, including helping colleges - especially business, education and technology, which serve the largest number of sponsored students - pay for employment of sponsored students, provide tutoring, housing on- or off-campus, airport pickup, grants to assist sponsored student activities, and to fund a sponsored student orientation. "We want these students to have an excellent experience, academically and culturally," Chaqra said. "When they are here we want them to get to know the faculty and staff outside of the classes or the business context. We want them to be able to get to know Indiana and the Midwest, so when they go back they are like ambassadors of the United States in their countries." Customer service plays a big part in recruitment, along with face-to-face conversations between Indiana State faculty and alumni who go abroad and meet with students and their parents and spread the word about their positive experiences on campus. "The customer service we provide and the experience those students have on our campus help to grow our numbers," McGrew said. "(Indiana State) has world-class programs that students are looking for (such as) insurance and risk management and higher education leadership, so we, as a university, just need to continue to build programs and provide supports that recognize international students as Sycamores. As long as we address those needs, students will keep coming." The Center for Global Engagement has set a goal to enroll 1,100 international students by 2017. "Indiana ranks in the top five for hosting international high school students, but it ranks in the bottom five for sending students abroad," McGrew said. "With the large population of first-generation students Indiana State serves, we have a demographic that isn't necessarily looking at the world but we want them to, so study abroad and interacting with international students who come here to study are good ways to encourage (our students) to see the world." Enrollment jumped to nearly 1,100 international students in 2014, an 18.5 percent increase from last fall when 926 international students were enrolled.